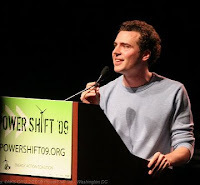 Billy Parish is an original co-founder of the Energy Action Coalition, the organizers of the historic Power Shift 2009 conference that has brought 12,000 young people together from the across the country this weekend in Washington D.C. this weekend. Billy is currently an Ashoka fellow working with Green for All, 1Sky, Energy Action Coalition and Black Mesa Water Coalition to help align efforts to advocate for a clean, just and sustainable energy future. I spoke with him Sunday evening as the thousands of young Power Shifters attended trainings where they prepared to ascend Capitol Hill tomorrow for the largest climate and clean energy lobby day in U.S. history. Jesse Jenkins: Thanks Billy for all your work, and for speaking with me at the end of a long weekend. Billy, in this youth climate and clean energy movement, you qualify as an aged veteran. You were an original co-founder and the first executive director of the Energy Action Coalition, and have been around to witness this movement grow and take shape. What are the key trends and changes you’ve witnessed, and how do you see them taking shape at Power Shift 2009? Billy Parish: Size, diversity, power. Those are the key trends. I see. On size, we’ve seen a doubling of the attendance in just over a year between Power Shift 2007 in November 2007 and this weekend’s Power Shift 2009. And we’ve actually seen that kind of pattern in the early Days of Action Energy Action Coalition organized, so maybe there’s something there. The first Campus Clean Energy Day had 70 campuses involved. The next had about 135 and then it went to 270 when we did it again. Now, we’re doubling in attendance from 6,000 to 12,000 for Power Shift. Looking around this weekend, I can also see how far we’ve come in terms of diversity, both when you look at attendees and speakers. That’s something that has been a real intentional focus and I think makes a huge difference and strengthens our power. Finally, there’s a recognition of our power now that wasn’t there when we organized Power Shift 2009. A lot of that has to do with the election, and young people’s role in driving change. In fact, we heard all of our political speakers this weekend, including Representatives Ed Markey and Donna Edwards and Obama cabinet members Lisa Jackson and Ken Salazar, attribute their victories young people’s pivotal role in the election. Furthermore, through our hard organizing, especially through Power Vote during the election, EAC has built a list now of over 400,000 young people across the country who are now connected to our efforts. That’s our growing power. In your keynote address on Friday night, you spoke about the necessity of sustained political engagement to secure a clean, just energy future. “It’s not about one rally or one lobby day or one event,” you told the audience of over 11,000, saying, “It’s less like lobbying and more like stalking… By the end of the year, your elected officials should know every one of you by name!” How do you suggest the young attendees of Power Shift 2009 sustain their engagement with the political process? Well short of standing outside in your Congressperson’s lawn! … The two immediate opportunities to start and continue that kind of sustained engagement: the Power Shift Lobby Day tomorrow, on Monday, which will be the largest lobby day on climate in U.S. history. The next great opportunity is the April Congressional recess, from the 6th to 19th. They should be meeting and introducing themselves to their representatives at Lobby Day on Monday and working between now and April to ensure they have a meeting then with their elected officials and as large a group as possible, whether through Focus the Nation, which is organizing town hall meetings in every congressional district in the country during the April recess, or just through a really big in-district visits to their offices. What kind of message do you think Power Shift 2009 is sending to America at large? My feeling is that this is a very powerful demonstration that this next generation is ready to lead, ready to pull our weight, but we cannot do it alone. Our hope is that this event and our actions inspires others all across America to join us and help build a clean, just energy future.